The UA-180 Carbon U-Mount Support for Large Lenses from Feisol provides support for large lenses that allows you to calibrate the mount to find the perfect center of gravity for the lens you're using. Integrated scales help make adjusting the lens to the correct height and width within the U-shaped mount a breeze. This lens support is constructed from advanced carbon, with an included QP-200 quick-release plate, and a base plate that rotates through 360° with a calibrated panning function. This is the ideal mount for large lenses such as the 70-200mm f/2.8, 200mm f/1.8, 300mm f/2.8 and similar very large lenses. Support system for large lenses--70-200mm f/2.8, 200mm f/1.8, 300 f/2.8, etc. Box Dimensions (LxWxH) 15.1 x 11.9 x 3.3"
Yes, the FEISOL UA-180 Carbon U-Mount Support for Large Lenses, B&amp;H # FEUA180, would be compatible for use with the Canon 400mm f/2.8 lens..
Can it be used with Sigma 150-500mm on Canon 5d Mark III? Yes, you can use this with a Sigma 150-500mm. Will this accommodate a Nikon D7100 with a Nikkor 18-300mm/f3.5-5.6G lens? 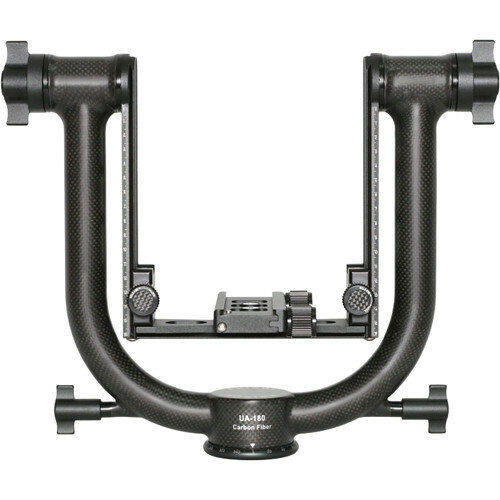 While this may be overkill for the 18-300mm lens, yes, the above gimbal would be compatible for use with your camera. Do note that gimbals are often designed to be connected to the tripod mount bracket on the bottom of large telephoto lenses.